When you click an app icon in the Dock of Mac OS to launch an app, the apps Dock icon will animate with a little bounce as that application is opening. Additionally, when you launch any other application from Mac OS, the app icon will appear in the Dock and it too will animate with an up and down dance as the app launches. The animated Dock icons have been around in Mac OS since the earliest days of Mac OS X, but some users may not want their app icons to animate or bounce in the Dock at all. With a simple settings adjustment, you can stop application icons from animating in the Dock in Mac OS, or if your Dock icons are currently not bouncing around, you can toggle a setting to get this feature to return again. A quick note: the animated bouncing dock icons are used as an indicator that a Mac app is opening. When you turn off the ability for the app icons to bounce/dribble in the Dock, there is no visual indicator that an app is launching. For this reason, most Mac users should leave the Docks application icon animation feature enabled in Mac OS, though if you hide the Dock regularly you might not even notice whether this is turned off or on in the first place. With the animate on application open setting turned off, you will click on Dock icons to open them but there is no indicator the app is launching, it will just open (or not) without a visual indicator, a little bit like how apps open in iOS. 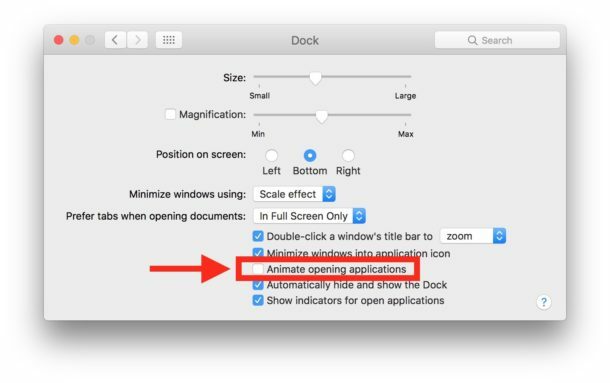 Of course you can re-enable the bouncing animated Dock icons at any time by returning to the default setting and simply going back to  > System Preferences > Dock > and checking the setting for “Animate opening applications” to be enabled again. Most users like the visual indicator that an app is launching and thus should leave this setting turned on. What about disabling Dock icon animated bouncing when an app needs your attention? If you simply turn the Docks application launching animation off, you will notice Dock icons may still bounce when an app needs your attention. Perhaps because there is an alert dialog, an error message, an installation has completed, or a task has finished. The Dock animation bouncing indicator as a means of alerting you can also be disabled, but that is accomplished with a defaults write command described here, which turns off all Dock bouncing behavior completely for both app launch and app notifications. If you turn that feature off however, the apps will have no means of notifying you of an alert or behavior that requires your attention, so that’s generally not recommended for most users either. While you’re messing around with the Dock, you might also enjoy some other little tweaks like removing the Mac Dock auto-hide delay or speeding up the Dock animations, or check out or many other Dock tips here. There is still an indication that an app is launching even when we turn off the animate opening applications setting. The dot under the app icon will flash. I have always hated the bouncing alert when an app needs attention. I turned that off a long time ago. One reason why I did this is because some app developers abuse this feature. This is a hold over from NeXTSTEP. Good noob tip, but very basic first grade stuff. How to completely remove the notification center from Mac OS? You can also just put it in permanent Do Not Disturb mode, which is what I personally do since it still allows access to the weather widget and Night Shift toggles. Thanks for sharing this awesome tip. I just disabled annoying dock animation on my Macbook Air. Now, this is what I was worried about since few days and this tip solved the issue within a fraction of seconds. Thanks for the tutorial.